Have you seen this photo of Donald Trump’s sons Donald Jr. and Eric? It made me do a double-take recently. But it’s not real. The photo has been altered to make the Trump brothers look like cartoon characters. Or something like that. Given the recent news stories about Donald Trump Jr.’s attempt to collude with the Russian government, the eldest Trump son has been in the news a lot the past few days. And it doesn’t look like Junior will be out of the headlines anytime soon. He tweeted out damning evidence that he met with a Russian lawyer who promised to provide dirt on Hillary Clinton, and the emails explicitly say that the Russian government wanted Trump to win. So you no longer have to just take US intelligence agencies at their word, I guess. But that goofy photo is a complete photoshop job and needs to be called out as such, much like the fake photos of Steve Bannon that have been doing the rounds. It’s not clear who first made the fake image, but the original photo is from November 12, 2005 at Mar-a-Lago when Donald Trump Jr. got married at his father’s private club—the same club that presents a massive conflict of interest now that foreign governments can buy a membership to peddle interest there. Other photos from that same day show not only Donald Trump Jr. and his brother Eric, but their sister Ivanka. 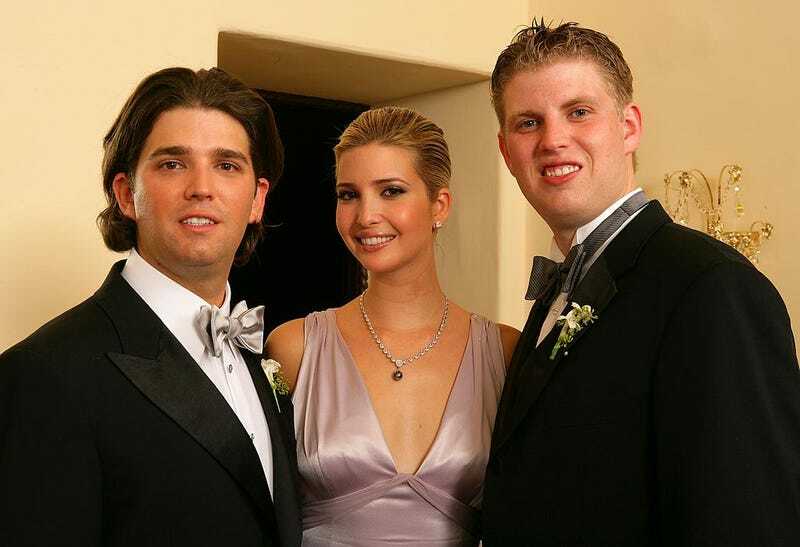 Their brother Barron wasn’t born yet, but the other Trump sister Tiffany isn’t included in the photos for some reason. Poor Tiffany. She always seems to be left out of the party. But it’s probably for the best, given the fact that the Trump regime is more or less a criminal enterprise at this point. Strangely, the Getty Images watermark has confused people into believing that the altered image might be authentic. But, of course, it’s possible to photoshop things with the watermark still on them. It’s not clear if Anthony Bourdain realises he’s passing around a fake. Donald Trump Jr. may be an incredible sleaze who sold out his country and deserves to be in prison, but that photo of him is “fake news,” as the big man is so fond of saying.